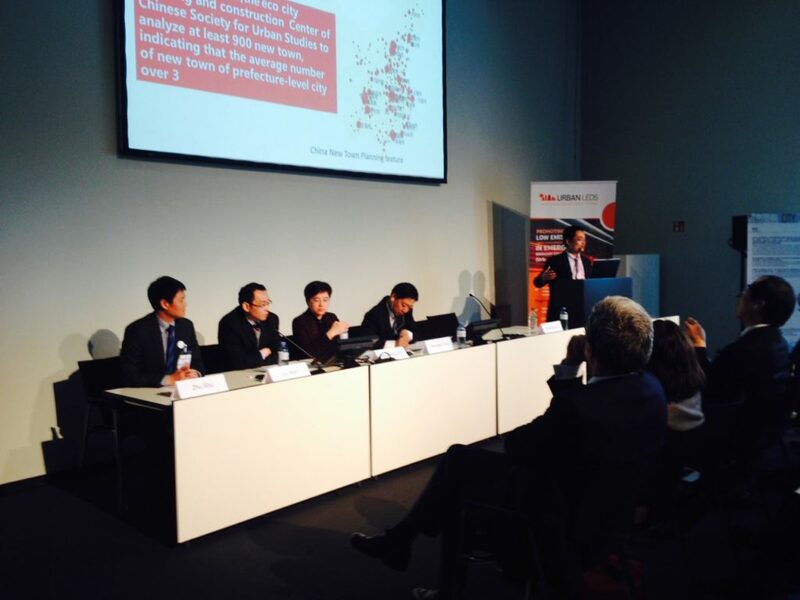 ICLEI was delighted to welcome leading figures from Chinese cities, institutions and government to Berlin for the Sustainable Urban China conference, which took place on the opening day of Metropolitan Solutions 2015. Aixing Han (Deputy Director General, Department of Energy Efficiency in Buildings, Science and Technology, Ministry of Housing and Urban-rural Development, Beijing, China) emphasized in his keynote speech how China’s explosive population growth and urbanization had generated specific problems. As the number of cities has grown from 200 to over 650 and as coal use has steadily increased, pollution and environmental degradation have come to the attention of citizens and of the government. As Han noted, Germany had become aware of this issue in the 1960s, and China was behind in this respect. However, he said, the national government was keen to pursue urbanization in a way that protected the environment and ecological systems. Panellists at the Sustainable Urban China conference. Franzjosef Schafhausen emphasized how the solutions to the problems generated by rapid urbanization – including social inequality and inadequate infrastructure for water, waste and energy – would have to extend beyond the city, incorporating agriculture and transport systems that cover regions and provinces. He highlighted the positive impacts of Germany’s energiewende, with an obligation for new buildings to reduce primary energy consumption by 25%, and with all government buildings required to be zero net energy by 2019. Transparency from governments and the strengthening of international connections would be paramount in the drive for urban sustainability, he concluded. Pedro Pires de Miranda noted that cities are moving towards increasingly intelligent infrastructure, but had yet to achieve full integration. He also highlighted the importance of resilience, suggesting that New York was now liable to experience flooding once every 15 years, compared with once every 100 years in the past. Siemens was working on solutions to decrease air pollution, which he viewed as the primary concern of citizens in cities. In the panel session that followed, the Deputy Secretary General of Zhangjiakou and the Deputy Mayor of Haimen presented their views on urban sustainability from the perspectives of large Chinese cities. Chengkui Yang of Zhangjiakou commented that his city is keen to follow a path to a low-carbon society and the application of renewable energy. In the afternoon, ICLEI brought together experts and participants for the Lounge Talks. It’s the children who teach the grownups, and not the other way around. Landahl also presented Stockholm’s engagement in the GrowSmarter project, which emphasizes integrated infrastructure solutions. Stockholm, for example, had looked into using lampposts as hubs for communications technologies, or ensuring that sensors were installed to switch off elevator lights when they are not in use. Later in the afternoon, representatives from Siemens presented the City Performance Tool (CyPT) and discussed it in Lounge Talks. The CyPT collects over 300 data points from cities looking to meet ambitious sustainability targets. It then assesses which of 73 technology solutions would be most effective for the city in question. We try to learn the language of cities – to translate the technology language into city language. The tool was the outcome of this engagement. It currently has five pilot cities, with 12 further cities on track to join. Other Lounge Talks looked at how cities could best work with the private sector to increase energy efficiency. Participants noted the significant difficulties of making retrofitting an economically-viable proposition for private partners.